The executive board will be discussing this matter internally and with our membership prior to making any formal statement. Our employer has given notice of intent to potentially contract out some of the work currently carried out by our members, and we have not yet met to exchange proposals. There are currently no dates set for ATU to bargain at this time. This Notice is to inform you that your executive is returning to the bargaining table today in an effort to reach a fair settlement. We will provide further updates as the process evolves. For your information we have hired a reputable pension actuarial firm to provide us with their overview of our pension plan and here are some examples of their findings. These are quotes from the document .”Given the surplus position in 2013-2015 on a mark to market basis, it seems that the city took advantage of out-dated 2012 valuation results to attempt to change the benefit promise from a defined benefit to a target benefit plan” They also state in this document “Taking on additional costs should not mean accepting additional risks such as those associated with a target benefit plan. Capping the employer contributions is an extreme design change that should be considered only if the plan was in severe financial turmoil ,which is not the case for the plan” At some point we will make the complete document available to you , but as of now we are informing you that we have verification that our pension position at the bargaining table is substantiated by this document. Stay strong and vigilant and we will perservere. United we bargain Divided we beg. ATU 615 will be hosting an awareness rally on Saturday September 10 at 3pm at city hall. 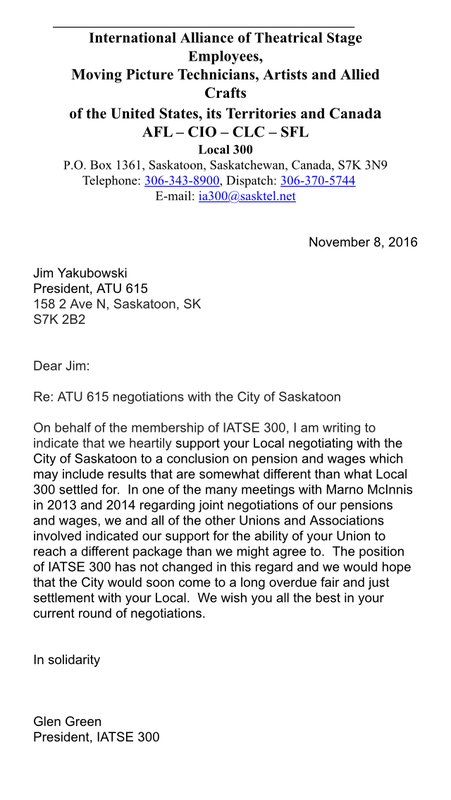 We have extended invitations to all labor organizations to join our members for a rally to increase awareness that the City of Saskatoon has yet to conclude a collective agreement with ATU 615 since December 31,2012.Our ATU sisters and brothers from Edmonton,Calgary, Regina ,Winnipeg will be travelling to join us for this rally and will be joining us in support of our cause. Please mark your calendar and plan on attending these events as guest speakers Larry Hubich- President SFL, Paul Thorp –President ATU Canada,ATU International IVP Bob Hykaway,among other dignitaries will be joining us in support of our cause. Shame on the City of Saskatoon. 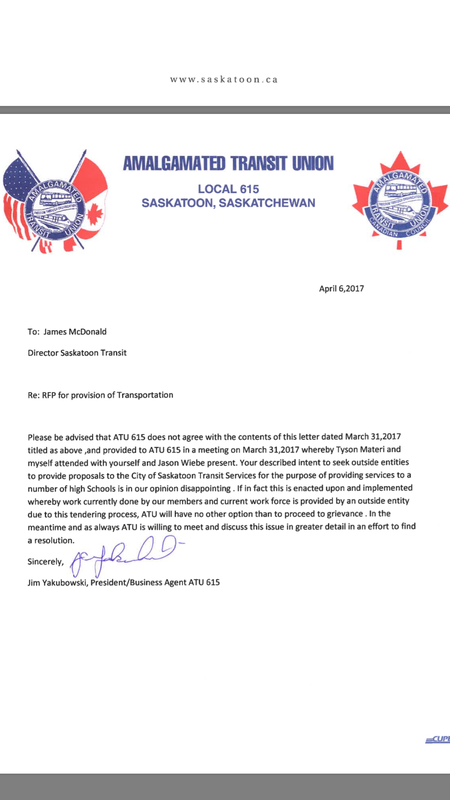 Our bus drivers are the lowest paid in Canada (yes, less than Regina’s) and have been without a contract for four years. These ambassadors of our city deal with the public everyday and have many lives in their hands. They are paid less than our garbage collectors. Perhaps whoever is negotiating for the city should be replaced if they are this inept and have failed to reach a deal in four years. These bus drivers should be told they are valued members of our city and given a decent wage. I cannot be the only citizen who feels that the drivers have been taken for granted and undervalued. We need to budget more for the service we want, which should also include new buses. Anyone who has travelled has seen how great public transit can be. 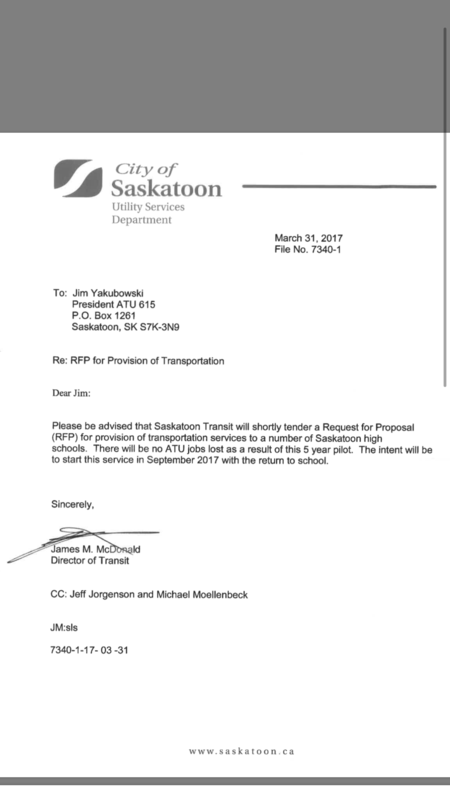 Come on, City of Saskatoon. It’s time to do better.